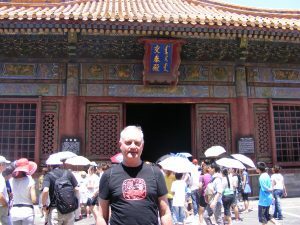 Today, The Forbidden City would be our target. 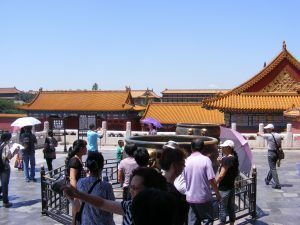 It is actually called the Palace Museum, since the entire compound is technically a museum, but Forbidden City sound more romantic and mysterious and was so named because for over 600 years, only dignitaries and members of the royal family and court could enter . As mentioned, there are gates at the north and south end but you can only enter the north. We stopped briefly at the south gate for a few photos since our hotel was near the south gate. 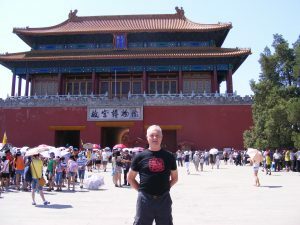 Then, we re-traced our steps as we had done going to Tiananmen Square around the perimeter or the compound to the south side. In all my photos you’ll see lots of parasols. 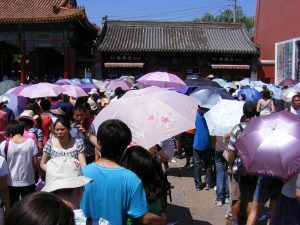 The sun and heat were very intense and a parasol is a very common year round item to protect from the sun. 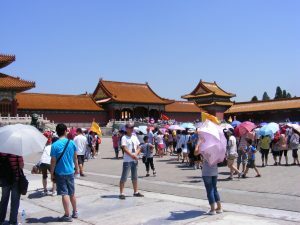 In China, a tan is not considered healthy or desirable, so men and women both protect themselves from the sun. Many of these parasols are UV treated for extra protection. 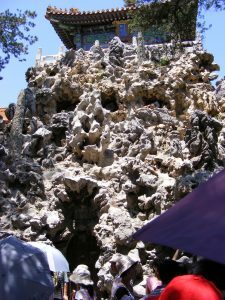 JianShan Park is directly opposite the north gate, so we spun around for a photo of the beautiful hillside and temple on top, before heading south for the Forbidden City entry. We waited in line for a ticket for about 20 minutes. 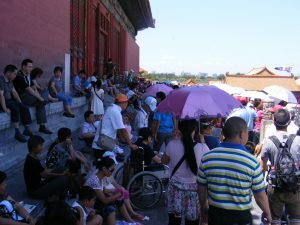 The tickets were 60 Yuan (about $8) and the lines to the ticket windows were in the baking sun with a sea of tourists, bearing parasols in front of us. just wandering around trying to soak-up the size and scope of the environment. The first thing one notices and continues to see throughout the place are hand carved stone railings, stairs, balistrades, walls, and ornamentation that gives the first inclination as to meticulous but massive work that went into the construction, begun 600 years ago. 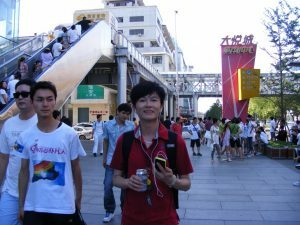 Of course, Bo always had his trusty yellow iPhone with all his Weibo (Chinese version of Twitter/Facebook) at the ready. Curiously, the outside world could never enter this place for centuries and now there’s virtual communication in and out to the rest of the world on a hand-held device. It was, at this point about high-noon with the sun directly overhead. Shade in any quantity was at a premium. 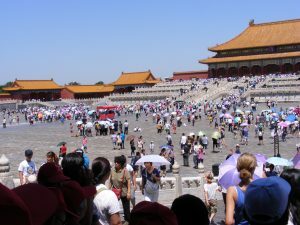 There were many additional side avenues and walkways running east and west where one could make a detour from the steady trek north through the center of the complex, with occasional stops for restrooms and refreshments. 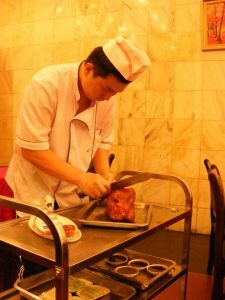 In Beijing, people do not drink the city tap water, so bottled water is commonplace. It’s even more necessary to carry water with you everywhere since there are no public water fountains. 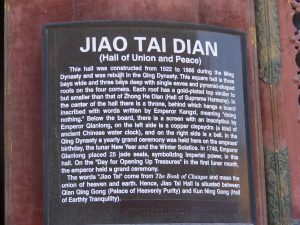 and then the Jiao Tai Dian (1522) Hall of Union and Peace. Clear English language signs tell the history and background. 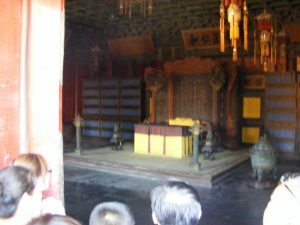 Near the end of the large series of halls was Kun Ning Gong (1420) another residence for the various empresses. 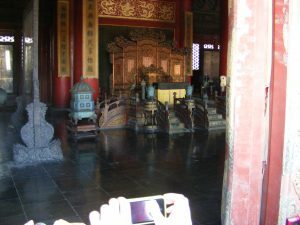 Incidentally, in addition to wives, the emperor had many concubines who all had private quarters elsewhere on the compound. 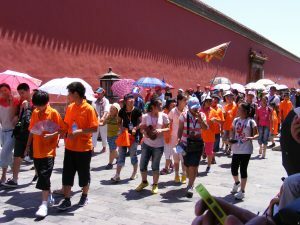 This is summer and not traditionally the best time for foreign tourists, but most Chinese from all over the country make pilgrimages to Beijing during the school’s out summer holiday. 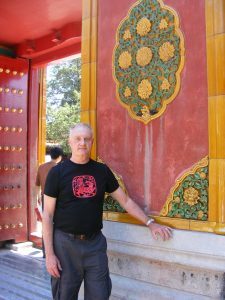 I am sure that it was many Chinese first and only visit to their capital city and were in as much wonderment at we westerners at the history and massive undertaking of building this palace. I stopped for a few moments to let a tour group pass. They are everywhere, usually clad in matching shirts, hats, and led by someone carrying a pennant to keep everyone together. A mother and two young daughters came over to me and wanted me to be in photo with them, for which I happily obliged their request. More ethnic celebrity. 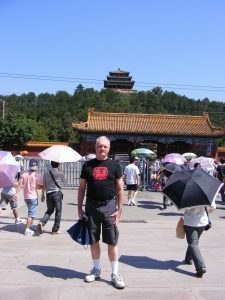 They get the Forbidden City and a tall American all for one price. 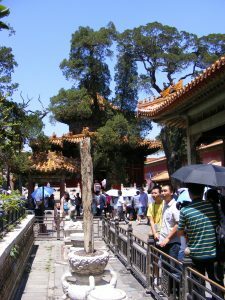 The next massive doorway enters into the Emperor’s gardens. 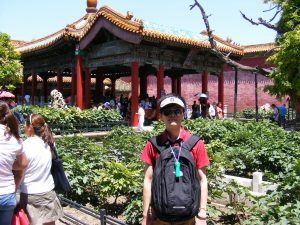 The formal gardens are the only places you’ll see any vegetation or foliage in the Forbidden City and it’s near the north gate exit, the oldest part of the compound. 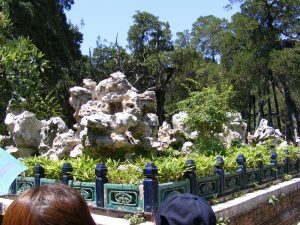 There are flowers, trees, and shrubs and one large stone-like grotto. From the gardens, we exited through the north gate. As mentioned, we were now almost back to where we started near the hotel which was one good thing about entering on the south and exiting the north…we were hot, exhausted, but practically home to the hotel with a shower and nap at hand. On the walk back to the hotel, I captured a few iconic items including the new-fangled “rickshaws”. 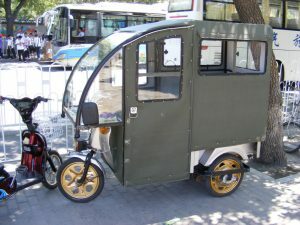 Now, electric motorized with a driver in front and a rear facing seat for 2 in the back. I’d like to have one of these in NYC. 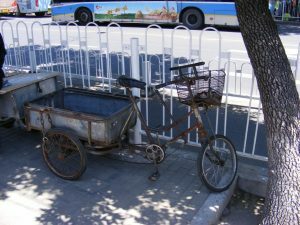 There were also large tricycles everywhere that seemed to be the mainstay workhorse vehicle for hauling, delivering, or transporting everything from trash to beer cases, to lumber, to fruit and vegetables. 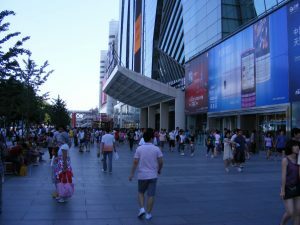 Following a few hour rest, shower, and change of clothes, we headed out to the newest, modern shopping mall of mostly upscale clothing with everything from Armani ,GAP, Nike, Farragamo, Rolex, Perry Ellis, etc. The food court featured a huge Burger King and Starbucks amid a plethora of smaller specialty eateries. The shopping street outside was wide and busy, full of people and well decorated with flowers and sculpture. 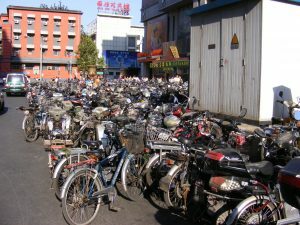 Near the mall on a side street was, no doubt, the employee parking lot…for bicycles. 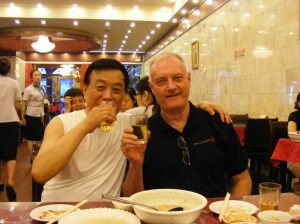 I taught Bo’s father one English word, “Cheers!” We had copious handshakes and good nights before Bo and I headed back to the hotel. Walking to the bus-stop, Bo called one of his friends (we’d met at karaoke) named Wevy (it’s a nickname, I don’t know what it means and it’s not Chinese, but he is). 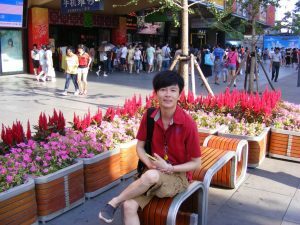 Wevy works at the Cartier jewelry store in Beijing and speaks very acceptable English. He also lives it the same neighborhood we were in, so Bo beckoned him to join us. A few minutes later he showed up on his bicycle. Rather than take the bus back to the hotel. Bo, Wevy and I walked and talked all the way back. It was a beautiful night and most wonderful day. Wow! 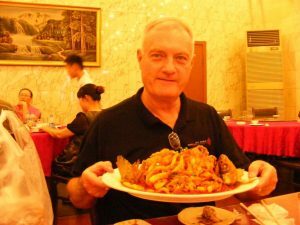 …I’m really in China!